It is but natural to fall in relationships that seem to appear rosy initially, only to appear as a difficult proposition later on. Yes you do tell yourself that you would try and adjust and expect the same out of the other person as well, but then you end up realizing that it is not all that simple eventually. Have you ever gone through any such relationship or heard or know of someone who has gone through it? Chances of hearing a yes from most people are extremely high and I am sure of the same. Ok here are some questions for us to ponder over-when a relationship seems to have probably reached its end what do we do? How sure are we that we gave it a fair chance to succeed? Are we willing to let go of each other amicably if it comes to that? Most importantly do we actually manage to move on in every way possible once the relationship ceases to exist? Nandita Roy and Shiboprosad Mukherjee are filmmakers who really make me wonder how they manage to come up with tales of relationship with such alarming frequency and yet manage to make each one of them different from the rest. It goes without saying that they are among the more prolific filmmakers not just in Bengali cinema but across India, among the rare breed of filmmakers who are consistently delivering quality films on a regular basis. 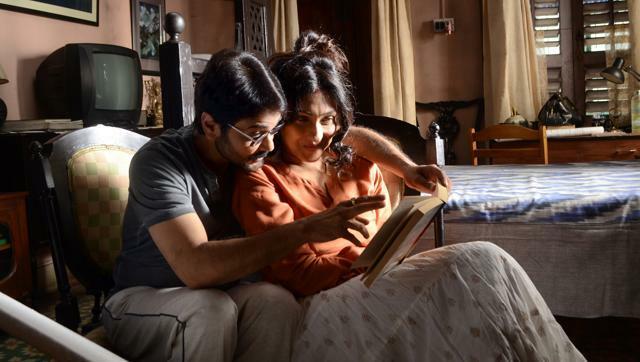 Their latest film Praktan is perhaps their biggest film so far both in terms of the starcast as well as the kind of release it has managed to get, not just in West Bengal but even All India thanks to Eros International. What made me and many others following Bengali cinema to look forward to the film was the pairing of Prosenjit Chatterjee and Rituparna Sengupta after a fairly long time. After all who can forget that they were once the hit jodi who ruled the hearts of the Bengali audience. Praktan (former) is basically about Ujaan (Prosenjit) and Sudipa (Rituparna) who have gone through a marriage which did not work. But the director duo has preferred not to show a straightforward relationship tale of these two individuals, preferring instead to use the medium of a train journey to narrate the journey of their relationship. The film begins with various people shown boarding a first class A.C compartment of Jnaneswari Express from Lokmanya Tilak Terminus in Mumbai, the start of a long journey to Kolkata (Howrah). Sudipa finds herself sharing her coupe with Malini (Aparajita Adhya) and her daughter Putul. Others in the compartment include the newly wedded couple (Biswanath Basu and Malini Dey), an elderly couple (Soumitra Chatterjee and Sabitri Chatterjee) who are off to Kolkata as their son’s family is departing to the U.S and a group of 4 musicians (popular musicians in real life – Anupam Roy along with Anindya Chatterjee and Upal Sengupta of the popular band Chandrabindoo aand Surojit Chattejee who was part of another popular band, Bhoomi). In their own ways some of the passengers seem to be having something about their past on their minds. The newly married couple briefly talk to each other about their past relationships and get on with their fondness for each other. The elderly couple is sad to leave behind their children but know that they have to move on with their own lives. One of the musicians reminisces about his association with the band that he was part of and his co-founder. And Sudipa finds herself in a spot of bother as she realizes that Malini and Putul are none other than Ujaan’s present wife and daughter. Upset over the same she clearly demonstrates that she has not completely forgiven Ujaan for whatever happened between them and seems to carry the burden of their memories. A common love for heritage and culture had seen the conservation architect from Mumbai, Sudipa to fall in love with Ujaan, an explorer as he liked to call himself and someone who conducted walks of different nature all over Kolkata and nearby towns. But of course life after marriage turned out to be unlike what they had expected leading to their eventual separation. Over the course of the 30 odd hours of the train journey we come across not just a way of knowing how all these passengers spend their time, but also get an insight into the failed marriage of Ujaan and Sudipa. Nandita and Shiboprosad use a non-linear approach in a subtle manner to shift the focus on and off from the train journey to the relationship between the two individuals who started off being madly in love, only to see their marriage crumbling in front of their own eyes. They ensure that the focus is more or less only on these two individuals when their past is shown, there is a mention of Ujaan’s close friend and Sudipa’s parents, but they are never really shown. Even the rest of the family members of Ujaan are barely showcased in an attempt to take us through their relationship curve. Over the course of their story we also get to understand how and what went wrong in case of their marriage. Beginning with a sense of apprehension and even disgust in a way, it’s wonderful to see Sudipa gradually opening up to Malini and acknowledging how wrong she was in her assumption about her. There are lots of wonderful moments in the film, like the one where the old lady complains to the railway attendant about the AC and other aspects in horrible Hindi as her husband humorously points out. The way Ujaan and Sudipa manage to just about have a soulful discussion about their past and of course the interaction between Malini and Sudipa right at the end, all these are examples of some wonderful writing by Nandita and Shiboprosad. There may be some who could be a little disappointed with the rest of the passengers not getting enough attention, especially Soumitra Chatterjee. Also that apart from the “Antakshari” sequence there is hardly any interaction between the people on the coach. But then let’s not forget that this is essentially the story of Ujaan and Sudipa and their failed relationship. Having said that it’s wonderful to see how well etched Malini’s character is and she is the one who in a way helps bring closure in the lives of both Ujaan and Sudipa. The film has excellent music, the songs by Anupam Roy, Anindya Chatterjee blend in with the narrative in a remarkable fashion. Be it the soulful “Tumi Jake Bhalobaso” (lyrics by Anupam Roy, female version sung by Iman Chakraborty and male version by Anupam Roy), the soothing “Kolkata” (vocals by Anupam Roy and Shreya Ghoshal and lyrics by Anupam Roy), the haunting “Bhromor” (lyrics by Radha Raman and vocals by Surojit Chatterjee) or the playful “Moner Guptochar” (lyrics and vocals by Anindya Chatterjee), all of them are easy on the ears and will remain popular for a while for sure. Gopi Bhagat’s cinematography is excellent, be it the night shots or those of the bright exteriors during the day. He has been aided tremendously by some excellent work by the production designer Nitish Roy and art director Amit Chatterjee. Of course for all the wonderful writing, the lovely music and some good work on the technical front, the film couldn’t have succeeded to a large extent if it were not for the casting choices and the performances. The film has been eagerly awaited for the return of Prosenjit and Rituparna as a pair on screen and Nandita and Shiboprosad have ensured that both of them are utilized in an efficient fashion in the film. While there is nothing outstanding about their performances, it is important to note that despite a fairly long gap they still retain an amazing chemistry on screen and bring to life even some of the routine scenes quite wonderfully. Though both Prosenjit and Rituparna are actors who still look wonderfully fit and can pass off easily as people far younger than what they actually are, it’s also clear in a few scenes that age is catching up with them as well. So it’s a little jarring to the eyes to see the kind of styling that Rituparna adopts in some of the scenes in the flashback. Leaving that aside it is indeed nice to see them both as a pair once again. Aparajita Adhya as Malini is the life of the film in a way and she holds her own comfortably in front of her two senior colleagues. She portrays the contrast when compared to Sudipa and thus the impact in the life of Ujaan, both on the personal and professional front. Praktan is a fine follow up of sorts to Bela Seshe, the blockbuster that Nandita and Shiboprosad gave us last year. In a way it looks at a relationship among a married couple from a different angle and from a different period of life. Praktan isn’t flawless, it does have its rough edges as well, but then the positives far outweigh the negatives. It also ensures that the hype surrounding the lead pair’s casting is certainly justified. The film manages to showcase how important it is not to wallow in the past but to move on and bring a culmination to the story and it achieves this thankfully without resort to preaching. Watch Praktan for it might possibly strike a chord somewhere in your heart. Note: Praktan is playing with English subtitles in select screens across various cities all over India apart from West Bengal. ← Ashiqana By Vaibhav Kashyap: Artist’s Diary!